I have decided to partake in few throwback Thursdays this fall, and republish excerpts from the blog I wrote in 2010 while living in France. I called myself “The Rhône Canuck” and shared my musings as a Canadian wine lover living and working in France. This first introductory post summarizes my decision to move to France. I hope you enjoy it! As a child sitting on my father’s knee while he sipped his wee dram and told stories about the good old days…Paris in the ’60s, drinking crate loads of excellent, cheap Bourgogne rouge…I never thought I would one day end up living in the country of his wistful reveries. But the seed was planted early and, it would seem, in fertile soil. By age seven my dad swore that I had “the palate of the family” as he poured out Sherries of varying qualities and asked me to sniff out the best. Though I’m sure my correct response must surely have been a fluke, the die was nevertheless cast. And so eighteen years later I found myself winging my way to Beaune, my personal mecca, with visions of Corton dancing in my head. I had been accepted at the CFPPA de Beaune (an agricultural college linked to an engineering university in Dijon) for a year-long course in “Connaissances et Commerce International des Vin”. My Dad and I celebrated my new adventure with a bottle of his coveted 1982 Leoville Las Cases. I knew from the first heady sip that I was on the right path. With my head filled with glossy Wine Spectator images of elegant, refined looking winemakers, I was in for a shock when I came across my first red-blooded Burgundian vigneron! And so launched my 6 years…and counting…love affair with Burgundy and the Rhône; the wines, the savoir-vivre and of course the people (had to throw that one in since I just married one!). Yes, the administration is a nightmare, the rudeness of the public service industry is hard for a nice Canadian to bear and everyone truly is always on strike. On the other hand, taking two hours for lunch everyday is a perfectly acceptable practice, and wine is always served. The story of Sherry is an incredibly fascinating one. The rich history of the region, the diversity of styles, and the complexity of the vinification process make these wines a truly exceptional tasting experience. So why isn’t it more popular? Trendy wine bar goers in New York and London would argue that Sherry is making a come back, but browse the aisles of your local wine shop and I doubt you’ll find more than a few dusty bottles tucked away in corner. According to Christopher Canale-Parola, North American sales manager for reputed bodega Gonzalez Byass, the main issue is poor “brand” image. Sherry is seen by many as an “old person’s wine”; not enough is being done to draw in a younger crowd. This puts me in mind of the Old Spice brand of men’s grooming products. For years, Old Spice was dismissed as grandpa’s cologne and largely forgotten. However, the crafty marketers at Proctor & Gamble were able to skyrocket sales 5 odd years ago with the “Old Man Spice: The man your man could smell like” campaign. The product didn’t change, but the funny, engaging commercial changed people’s perception and the brand became cool again. Sherry is seen by many as an “old person’s wine”. Sadly, the Sherry wine region doesn’t have quite the same advertising budget as Proctor & Gamble, but knowledge is cool (it’s true…my mum said so). Educating the more adventurous consumers among you and encouraging everyone to get out there and try a Sherry or three is our best bet. So if you are curious to learn more about Sherry, read on! Sherry is produced in the region of Andalucia, in southwestern Spain. The heartland of cultivation lies within the “Sherry Triangle”, the area between the three main production cities of Jerez de la Frontera, El Puerto de Santa Maria and Sanlúcar de Barrameda. What is so special about this land? First of all, the dazzling white soil. Albariza is a mixture of chalk, limestone, clay and sand formed from the sediment of ancient marine fossils. The excellent water holding capacity of this porous soil allows vines to flourish despite the region’s arid summer conditions. Secondly, the unique interplay of weather patterns. The rainy fall/ winter weather brings the necessary water. The long, sunny summers spur vigourous growth. And two dueling winds: the poniente (western breeze bringing moisture-rich from the Atlantic ocean) and levante (south-eastern hot, dry gale said to drive men mad) provide perfect wine ageing conditions. The majority of Sherry wines are made from the Palomino Fino grape. The prized attributes of this variety are its high yield levels, relatively neutral character and moderate acidity. It is the perfect blank canvas on which to display the winemaking techniques that result in Sherry’s particular aromatic profile and palate character. The wine produced here is fortified, meaning that a neutral grape spirit has been added to increase the alcohol content. In this health conscious day and age, you might be wondering why anyone would want to deliberately boost alcohol? The practice of fortification was borne out of necessity to withstand long boat journeys. Harmful yeasts and bacteria that regularly caused wine to referment (becoming fizzy), turn to vinegar, or spoil in other ways were found to become inactivate in higher alcohol environments. With further experimentation, it was also determined that the level of alcohol added had a significant effect on one of the major factors that makes Sherry so unique: the flor. Palomino…is the perfect blank canvas on which to display the winemaking techniques that result in Sherry’s particular aromatic profile and palate character. Dry Sherry is made initially in much the same way as any other unoaked white wine. Fermentation produces a dry, base wine of 11 – 12% alcohol, called mosto. During the roughly 6 week period of maceration and settling that follows, a curious thing occurs. A film of yeast forms, gradually covering the surface of the wine completely. The yeast coating, called flor, is either encouraged in its development, or destroyed, by the fortification. Flor develops best at alcohol levels of 14.5% to 16%. The pale, delicate Fino and Manzanilla styles of Sherry are fortified to 15% and spend their entire maturation under the flor barrier. The flor has a number of intriguing effects on the mosto. It acts as a natural oxygen barrier, keeping the underlying wine pale and fresh. Think of it as the plastic wrap you would use to keep cut apples from turning brown. The flor also performs a complex set of metabolic processes that result in the development of attractive nutty, green apple aromas and in the conversion of all remaining glycerol, leaving the wine bone dry. At over 16.5%, the blanket of yeast is destroyed. Rich, dark Oloroso Sherry is fortified to 17% or 18% alcohol and deliberately exposed to oxygen. Over time, the wine slowly turns a deep shade of mahogany and gains in power and concentration as the water evaporates. The activity of the flor leaves the wines pale, fresh and bone dry…with attractive nutty, green apple aromas. After fortification, the wine is transferred to barrel for ageing (or crianza). 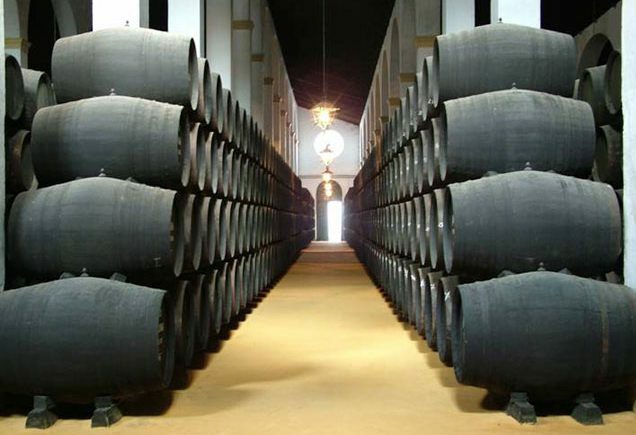 Both styles of Sherry are aged in large, old American oak casks. The casks are filled to only 5/6 of capacity allowing ambient oxygen to either feed the flor, or create the oxidative reactions mentionned above for Oloroso. The barrels are arranged in a multi-level set-up called a solera system. Essentially, this is a form of fractional blending whereby the top tier of barrels are filled with the new wine of the vintage. At each bottling, a small portion of wine is withdrawn from the bottom layer of barrels (called solera), in a process named the saca. The bottom tier is then replenished with wine from the level above (the first criadera), which is in turn re-filled from the level above this (the second criadera) and so on for as many levels as the bodega chooses to have. FINO: Made only from the delicate free run juice, fortified to 15%, and aged entirely under flor. Pale straw in colour, bone dry, with a sharp quality and singular aromatic profile of baker’s yeast, fresh almonds and green apple. 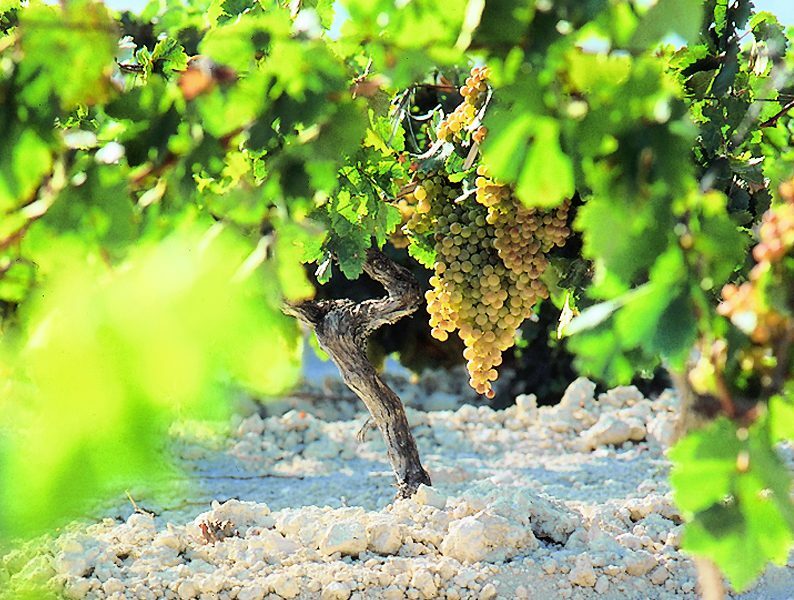 MANZANILLA: Produced in the same manner as Fino, but exclusively in the town of Sanlúcar de Barrameda where the proximity to the sea results in thicker, denser flor growth. Delicate floral aromas and a faint salty flavour set this style apart. 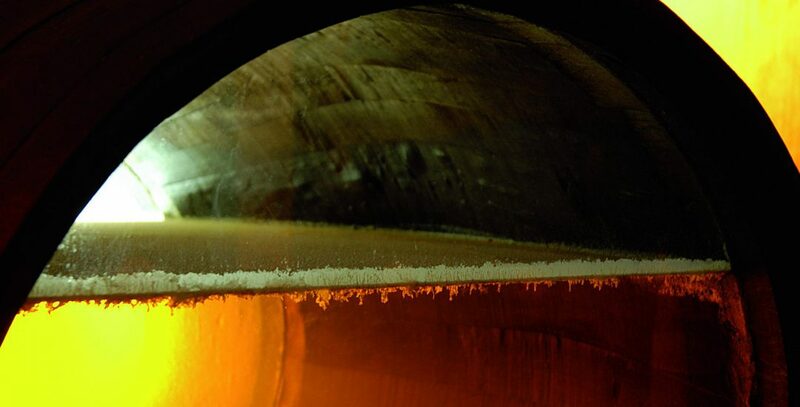 AMONTILLADO: Starts out as a Fino but, for various reasons, is eventually re-fortified to 17% and continues its maturation in oxidative conditions, like Oloroso. Amontillado has the yeast aromas and dry texture of Fino, with the deeper colour and more intense flavours of Oloroso. PALO CORTADO: Also begins ageing as a Fino, but for a shorter time period than Amontillado (only 1 – 3 years). Once the flor veil has disappeared, ageing takes place under oxidative conditions. According to the Jerez DO Regulatory Council, Palo Cortado “combines the smooth, delicate and sharp qualitites of Amontillado with the vinous, rounded qualities of Oloroso”. OLOROSO: Made from the gently pressed juice, yielding darker, more structured, tannic wine. Fortified to 17%, this wine ages under oxidiative conditions. Dark in colour, full bodied, rich and rounded with a nutty, vinous flavour profile. VINO DULCE NATURAL: naturally sweet wine made from the Pedro Ximénez or Moscatel grapes, fortified after the partial fermentation of grapes left to shrivel in the sun (soleo). These are rich, heady, highly viscous wines that can contain dizzying levels of residual sugar (350g/L + for many PX wines). According to Sherry expert César Saldaña, Director of the Regulating Council of the Sherry appellation (DO), Tio Pepe is a classic example of well-made Fino. Brilliant pale straw, with aromas of baker’s yeast, green apple and fresh almonds. Sharp, bone dry and precise on the palate, with a clean, zesty finish. Aged in barrel for a minimum of 4 years. Pale straw colour. Delicate chamomile flower and orchard fruit notes are underscored by baker’s yeast and nutty aromas. Bone dry, with a tangy saline note on the palate and a clean, linear structure through to the medium length finish. Aged 5 years in a 7 tier solera system. Pale amber in colour. Somewhat restrained nose with hints of yeast, mingled with grilled almond, caramel, woody and spiced notes. Very dry on the palate, with medium body and warming alcohol. Pale amber in colour. Intense woody, spiced notes feature on the nose, with undertones of hazelnuts, leather and caramel. Rich, rounded and full bodied, with a dry, lifted finish. Medium amber in colour. Elegant, complex aromas of cinnamon, nutmeg, marzipan and citrus, overlaid with woody notes. Crisp and fresh on the medium bodied palate, with attractive baker’s yeast notes on the dry, lingering finish. VORS on a label means “very old rare Sherry”. These fine wines are aged for 30 years or more. This outstanding example is medium topaz in colour. Intense, and highly complex with aromas of dried fruit, grilled nuts, mixed spice, leather and caramel on the nose. Crisp, dry and richly textured, with excellent concentration of flavours. The finish is very long with nutty, yeast and dried orange peel notes.